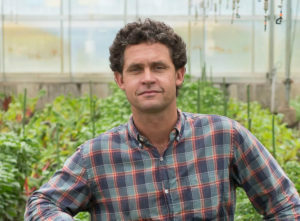 Jack Algiere is farm director at Stone Barns Center. Jack graduated from the University of Rhode Island with a degree in horticulture and has been actively farming since the early 1990s. His lifetime of experience in organic, biodynamic and ecological systems brings a broad diversity of experience in greenhouses, orchards, fields and pastures. At Stone Barns Center, Jack oversees the extensive and diverse farming operations, integrating multispecies pastured livestock, grains, field crops, greenhouse, fruit, flowers and compost in a four-season agroecological system. He also oversees the greater public and wild landscape as elements of the whole farm system. Jack is a leader in the farm’s innovation programs and is integrally involved in training beginning farmers.